Sunday, West Torrens Birkalla celebrated a 3-1 win over Adelaide United in Round 2 of the PlayStation 4 National Premier League South Australia. "It was a good show of character from the team, especially after last week's wake up call. "We turned it around, and it was very important to get our first three points early," says Julian Torresan, Goal-Keeper and Captain of Birkalla. If you were watching, you better have found an early seat because Paul Radice showed up with a goal just five minutes in, setting the tone for a short-fused cracker of a game. "We knew United are a possession based team and they wouldn't handle hard pressure too well. "We managed to pinch the ball from them early and score a great goal from Paul [Radice]." "If you give Paul Radice that much room on a corner, he will punish you every time," says Torresan. Radice slotted neatly again at 24 minutes off a corner from loose defending. Torresan led from the rear, keeping his team tight at the back while the front three kept it slick up the top, it was a stellar display of transition-football, with Birkalla dominating in the front third and in defense. "When you play a team like United, you are able to press them high on the field and keep a good structure out of possession. "It was very important to counter them quickly when we got possession of the ball." It was a game won in the first half, and Birkalla knew they needed to quash the bravado of the Adelaide United frontline from the start. "We wanted to give them as little space and time as possible … they're dangerous on the ball." Ian Kamau scored the third at 40 minutes, quashing any hopes of rebellion, where in the second half of the game, Birkalla sat off. "We kept up our pressure until we got our third goal, then we dropped off to see the game out, bringing the fight to us. "We still had plenty of chances in the second half, we just couldn't convert them." Torresan says. Remembering the woes of last season, Torresan was thrilled the team [Birkalla] embraced the importance of grabbing every point, and has great expectations for this season. "It was a really good learning curb for a young team like ours, you have to take every point you can get, especially this year with the teams in the league. "It's going to be very competitive." United are hurt, but their wounds will heal – Sunday's loss is a point of reflection, and an opportunity to learn and improve, says Jordan O'Doherty of Adelaide United. "No footballer enjoys losing, so you can imagine we are all disappointed with the loss ... we didn't get what we wanted from the game. "We go in to every game wanting to play good football and get a result at the end of the game, but I don't feel like we played our best football." O'Doherty says. At 30 minutes, going into half-time, his goal was United's chance to find a way back but they weren't able to gain any traction. "Getting a goal back to make it 2-1 gave us hope and momentum for a short time, until Birkalla scored their third. "We shouldn't have let that happen so easily, it broke our momentum going into halftime." A loss is a minor setback and the boys will be out for fresh scalps this week, where they hope to assess and then learn from their mistakes from Sunday night. "It's only one loss and we will go into training this week with it completely in the past. "We will train hard and work on any issues we may need to address ahead of next week against South Adelaide." 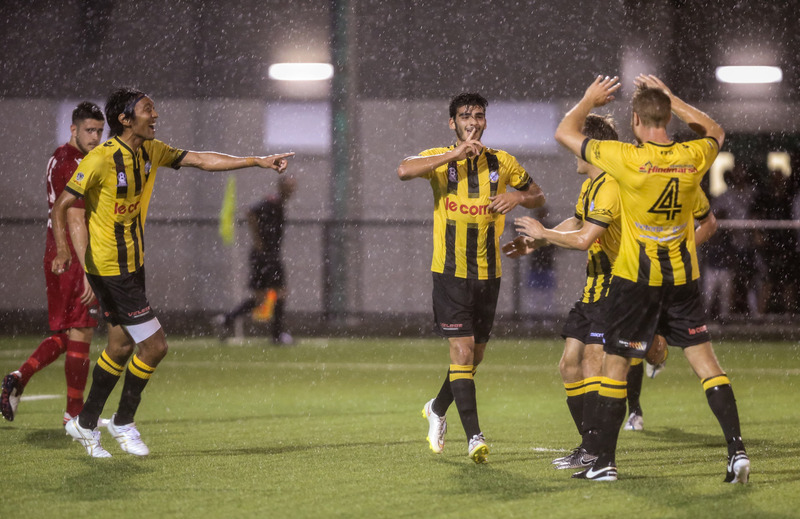 The team is markedly dangerous going forward - after knocking off Adelaide Blue Eagles in their first round fixture. The key, O'Doherty says, is building on that victory for games in the future. "We're eager to improve each week, and our squad is capable of proving that we can play good football and win games as a result of that. "Our performance against Birkalla can be forgotten, and now we look forward to playing more games like we did against Blue Eagles." Adelaide United's next fixture in the PlayStation 4 National Premier League South Australia is against South Adelaide, who are desperate for a turn-around after last week's drubbing from Campbeltown City. While Birkalla will be at home against Adelaide Blue Eagles, which is set to be a massive game.